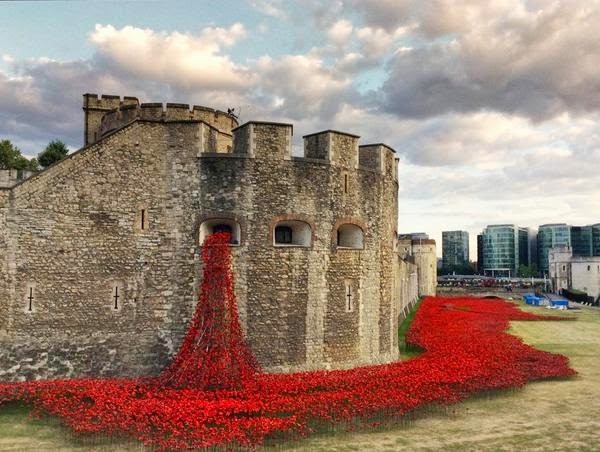 100 years ago today the UK entered the First World War & history changed irreparably. Even fashion would be different. The 'flapper' of the 20's developed because of a war induced loosening of morals kind of tied into women getting the vote in the UK when we did (because of what we did in the war). The 'new look' of the 50's was a response to the austerity of the War & so that never would have happened & without that we never would have had the 60's & mini skirts etc. Everything about today's world can be traced back to the first world war. Heck who knows whether the internet would have been developed yet if technology hadn't been pushed by the all the conflict. It is easy to see how the world would be different but you can't know what would have been there instead. I can pretty much pinpoint the exact difference in my Mum's side of the family & what would have happened instead. My Great Grandpa Fred would have been able to take up his scholarship at the Grammar School that he couldn't accept because his father had been gassed in the First World War & the family needed the money he would earn by working. He would probably then have gone on to university & could have been a professional cricketer (if anyone from Yorkshire has heard of Len Hutton, he was in my Great Grandpa's circle of friends & according to the family Len Hutton's older brother was the better cricketer but had to work...ditto with my Great Grandpa). He probably would still have married my Great Grandma because that was fate but they would probably not have had to wait so long to wed because they wouldn't have been supporting my Great Great Grandpa's medical bills & would have had children earlier. My Grandpa's Mum (assuming she left Germany still) wouldn't have lost all her siblings in the Second World War (one died in a Russian prisoner of war camp, one died in a concentration camp regiment & her sister worked in a children's hospital where all the nurses committed suicide after the Russian army went past) so she wouldn't have been such a weird woman. And Grandpa's Dad wouldn't have been away 'fighting' for the first seven years of his life - he spent the whole war in the Azores/Canada - & so Grandpa may not have had to escape his family at 16. He may then have continued on to University like his friend did & if he had still married my Grandma they wouldn't have had to get pregnant with my mum to push his family into allowing them to marry - his Dad didn't approve of the marriage because Grandma's Dad (Great Grandpa Fred) went to work in overalls & he (Grandpa's Dad) was a manager at Woolworths - & my Mum might have been born much later. My German Great Grandma's family would also still have all their money & their expensive house near the Deer Park in Hamburg (when my Great Grandma got married her wedding present was a - I think - 72 person silver wear set including a suckling pig plate). My Grandma left University because she was spending her time on the Student paper instead of working & went on to be a teacher. If she'd not been the first in her family to go to university - & from no money - she may have finished her degree & gone on to be a journalist & moved as journalists inevitably do & my mum would have been a Southerner (or, more likely Grandma would have been rushed across the Yorkshire border the way her brother's wife was in case the child was a boy - you couldn't play cricket for Yorkshire back then unless you were born in Yorkshire - & Mum would still have been Yorkshire through & through). I can't exactly pinpoint the effect the war had on my Mum though. She probably wouldn't have done a degree in Librarianship because she would have been a very different person in a very different time. I think by the time you get to my Mum the world would be so different from this one that you wouldn't be able to recognise it. It would have been a very different place. But the wars did happen. The combined death toll of the two wars is somewhere around 103,000,000 people. If you include the number of people who died in the cold war & all the wars & conflicts that have happened due to things that came about because of the First World War, I calculated the total number of deaths caused by the First World War to be at least 177,549,225 (I would not recommend trying to verify, you go numb around 140,000,000 & it takes hours to feel less freaked out). And it's probably more than that because that was only including conflicts, I forgot to include massacres & 'ethnic' cleansings. I don't know, I just felt like I had to do something to do something. I couldn't just pass it by you know? A brilliant, intelligent and emotive post.So well written and highlighting a very important part of our past. Weirdly I was chatting with my son yesterday about the effects of World War 1 and he was commenting on how much WW1 and WW2 affected popular media, comic books being his example as he's that kind of boy. As he said with no WW1 there would have been no WW2 so no Captain America and no Superman, never mind the knock on effect with other superheros after all where would Spiderman be with radioactivity and spiders! Not a major effect of the Wars but just shows just how much the 2 Wars and all the attendant politics and such like have affects even such trivial aspects of our lives as comic books.